Spent the day climbing the Northern Formation near Mt. 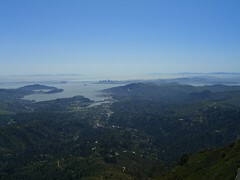 Tamalpais' East Peak. We dropped two lines which gave us access to about 3 routes for each line. It was a bright, hot day and we got in some great outdoor climbing. I also set my first top rope anchor! Corey supervised, but I did everything myself, tied the nots, set the slings, adjusted and so forth. Not too hard, but it was a nice feeling. And promptly fell 3 times during my first climb using that anchor, so I'm glad I did it right!